It’s possible you haven’t seen glue guns since those even high school or even middle school days shop class which you’d rather forget, along with all the other troubles of youth. You may still have the burns dotted across your arms, fingers, and even other places which is still a mystery, and the less thought about those, the better. If you look back on these days a little more fondly, though, you’ll remember how versatile the best glue guns could be, which is why it may be time to revisit their potential. Using hot glue to fix, create, and customize everything from crafts to clothes to furniture to ornaments is an under-appreciated but also easy (easier than you’d expect, anyway) art. Glue guns are cheap, they are easy to use, and they’re often more effective than relying on stitching or superglue, and you’ll not end up threading or sticking your fingers together, either. We’ve made our picks for the top glue guns for you to buy right now to explore your creativity or increase your resourcefulness, whichever you like. The top pick for the best glue guns is the ccbetter Upgraded Mini Hot Melt Glue Gun which is an awesomely effective and remarkably affordable option for a variety of applications whether you need to use it at home or at work. It heats within 5 minutes, giving you ample time to make yourself a coffee or tea and get everything ready to go, and using smart temperature control, it retains a consistent heat throughout your project. Even though it’s a mini glue gun, it still offers a substantial glue feeding with a smooth and controlled stream to ensure there’s as little mess as possible. The anti-hot cover is there to keep your safe from wayward strings of glue which could end up with someone getting hurt, and the LED light lets you and others know if the gun is switched on. For immediate results, it comes with 30 glue sticks so you’re ready to go as soon as possible, and you can load these easily into the chamber. The built-in stand at the edge of the barrel is useful, but its size means it can get stuck behind the trigger. This is a small issue though and doesn’t interfere with the gun’s performance. It may also be a little too small for large jobs, but for casual and easy projects or repairs, you’re unlikely to find anything that’s this effective, efficient, or reliable. Make sure you also check our guide to the best wood glue. The Black+Decker Cordless Glue Gun is a lightweight and highly convenient gluing option for those who want to make the world a better place, with a glue gun on hand at all times. That may be a little hyperbolic, but the point still stands. As a cordless hot glue gun, it is provides an unlimited range of motion as long as you have a charger close by should the battery run down. It’s 20V lithium battery gives you 3 hours of battery life, which is perfect for long projects, although it also takes a long time to charge, which could pose a problem when on jobsite or without a replacement battery. Its 125V heater makes it easy to squeeze streams onto your surface with little trouble, even for those who have never used a glue gun before. The heavy-duty design is reliable and robust, making it ideal for workshops while also ensuring it lasts through a variety of demanding projects and gives you confidence when on the move. It also heats up quickly while the nozzle is specially designed for excellent precision. With the correct glue, you can ensure quality results as it sets quickly and reliably. It may not be ideal for casual crafts with the kids, but for repairs and professional woodworking jobs, it’s a robust option that will fit in fine in any tool box. 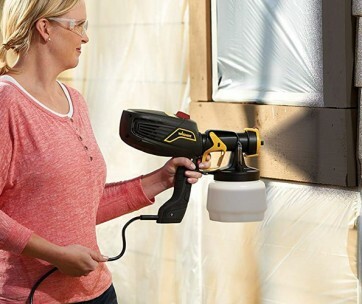 Tough and ready to tackle a variety of environments, the DeWalt Rapid Heat Ceramic Glue Gun is a top quality option that ensures longevity like few other options around. Perfect for those in a hurry (but hopefully not too much of a hurry they are careless), its ceramic heating element heats 50% faster than your standard glue gun, while the high output design is ideal for managing glue stick after glue stick. This makes it an excellent choice for the more craft-oriented among you, and you can go through 50 glue sticks in an hour, depending on the project and your control. Even with such a high use, it resists overheating to provide safety and keep it performing at a high level. Like all DeWalt tools, it’s constructed for repeated use while still delivering high quality results. The robust casing is comfortable and protects the gun from damage. Its fold-out stand is also sturdy to prevent accidents on the table and damaging work surfaces. It’s also easy to use, but the trigger can be a little hard to pull, at least when you first use it. While you’ll get used to it, there’s still the chance you could push too much glue from the nozzle, so take care to ensure nothing gets ruined, and warn others about it when they use it for the first time. Make sure you always have it handy in your tool bag. The Ryobi One+ 18V Cordless Hot Glue Gun is a convenient option coming at a similar price to its Black+Decker counterpart, which is also cordless. Heavier than the B+D, it may not be too comfortable to use all day at least for your arms, but the rest of the casing design is ideal for ensuring you resist cramp and strains in your hands and maintain control with your projects. It boasts a large two-finger trigger, which is ideal for measuring the exact amount of glue you need for each craft, and it also delivers a longer run time than the Black+Decker, although it’s only half an hour more, so use that extra time wisely. It heats quickly, although this affects the battery charge, even with the extra time, but at least you won’t waste too much time waiting around. As it’s a Ryobi One+, you can install batteries from the same range if you’re looking at an all-day job. You’ll have a variety of glue stick options, as it takes different brands with no issues, and the continuous heat design ensures consistent quality and performance throughout. If you need a cordless glue gun, it may be a challenge to select between this and Black+Decker, and your decision may come down to nothing more than personal preference. If you like cordless tools, check out our guide to the best cordless drills. With the Anyyion AI 300 Watt Hot Glue Gun, you can select the operating temperature for versatility when working with different fabrics and materials, ranging from 150 to 300 watts, and controlled via an easy-to-reach switch on the base of the handle. This is perfect for ensuring safety, especially if you’re using it with children. 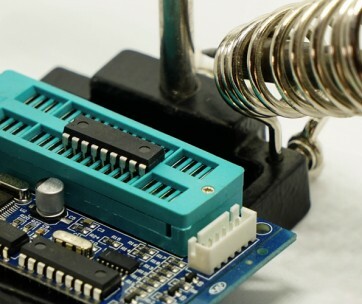 The Smart Temperature Control system, which takes less than minutes to reach optimum heat, eliminates the risk of overheating, while a built-in chip provides longevity while also conserving energy to prevent parts damage, which also gives you peace of mind that there’ll be no accidents when using it, which is always nice to know. Its vibrant yellow casing makes it easy to identify in a drawer or rolling tool box, and its design makes it easy and comfortable for hold. While it may not be the best option for longer crafts or projects, this comfort at least reduces aches on the hand so you won’t dread using it next time. It’s a little smaller than some options, too, but this doesn’t affect its ability to dock larger glue sticks to save time replacing small sticks and keeping you productive. The construction also makes it easy to reload, so even if you’re new to glue guns, you’ll get by just fine. A low-temperature glue gun perfect for heat-sensitive crafts and projects, the TopElek Hot Glue Gun is a cheap and cheerful option that makes no assumptions about being the glue gun to end all glue gun. Instead, it’s a way to introduce yourself or your kids to using them and discover just how effective they can be. With a maximum temperature of 100 watts, it’s perhaps the best and most appropriate glue gun for fabric, and even though it’s not as powerful as other, the full-size design ensures control and comfort combine well to provide a simple-to-use product for all ages. However, its price means it won’t be as high quality as the more expensive options, and so it’s not recommended to be used for too long, as the element may not handle it. To ensure longevity, the built-in fuse prevent overheating and keeps everything protected for working too hard (even you!) while the constant temperature provides a reliable performance regardless of what tasks you start. This takes just 5 minutes to heat up, and can often reach peak temperature in just 3 minutes. It also comes with 12 glue sticks for immediate action, and these are non-toxic to stop you inhaling any dangerous fumes, so any lightheadedness you feel is likely because you’re having so much fun with your crafts. Be sure to also check out our list of the best drill presses for more great items like this. The Chandler Tool Commercial Glue Gun is a mid to upper range option which boasts a solid, reliable build for both budding DIY enthusiasts, craft hobbyists, and professionals. Immediately, it’s Grab-and-Go! stand pops out as an easy and massively convenient addition to ensure protection for countertops while also preventing the gun getting stuck to the table. It also gives you somewhere to safely store in while taking breaks, or when you’re taking a day off from glue gunning your way through the house. The precision glue feed is controlled and prevents dripping, while its heavy duty wattage is perfect for longer jobs which other, smaller, less-expensive glue guns would fail. This is further confirmed with the UL-certification, and ensures quality, reliability, and durability through hundreds and perhaps thousands of crafts, repairs, or projects. It takes a little longer than others to heat up, so if you’ve got a lot on, it may be best to look elsewhere. If not, though, then it’s a superb option for those who don’t want to spend too much on their glue gun, but also need the quality that may not always be present in cheaper models. You also get 10 glue sticks included with your purchase, which isn’t as good as other options, but is better than nothing, and gives you the chance to check out how effective it immediately. Our handy guide to the best electric paint sprayers features more great products like this. If you’re after an option which provides superb value in all aspects, the Gorilla Hot Glue Gun and Sticks is the perfect option for you. It’s compact and lightweight design makes it easy to handle, while the dual temperature settings provide a level of versatility for tackling different projects while also allowing it to accept different temperature glue sticks. The precision nozzle ensures a careful and considered stream of glue, and its easy-squeeze trigger prevents an overload of glue onto the surface, which might ruin your project. There’s also a kickstand useful for anytime you need to take a break and is made from the same sturdy plastic as the gun’s casing to provide durability. It’s powerful, and regardless of its low price it still boasts a quality you’d expect to find with something much more expensive, ensuring longevity and reliability. The rubberized handle is also a welcome inclusion to ensure a better and more comfortable grip. While compact, it may not be ideal for all-day jobs, and the glue gun refill sticks – which are weatherproofed and of which there are a generous 75 – aren’t the largest available. For craft days with your kids or simple repairs to your shoes’ soles, though, it’s a perfect, portable, and easy to store option for the household. Love this product? Check out our review of the best heat guns for our top picks. 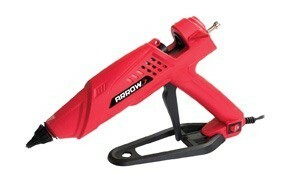 Going from the best value to our premium choice, the Arrow Fastener Pro High Temp Glue Gun is the top option for professionals searching a long-lasting and reliable product. At 300 watts, it reaches superbly high temperatures perfect for a variety of demanding jobs or projects and ensure superior bonding regardless of the material you’re working with. For efficiency, the element heats quickly to minimize downtime, and this stays at a consistent temperature for the duration. Not only is this ideal for continuous and uninterrupted work, it also prevents the gun overheating, which could cause damage to the internal parts and maybe you, especially if you’re not careful. You’re guaranteed further safety with the insulated nozzle, which is great for you, and if you’ve got kids peeking over your shoulder showing classic child curiosity, it’s great for keeping them safe, too. With an oversized trigger, it’s easy to use and allows for a controlled stream of glue as you work. The power, heat and performance come at a price, though, and as the unit is corded it means you don’t get as much of a range of mobility as cordless options provide. Anyone who knows their corded vs cordless tools understand such limitations, though, and as long as you’ve got a dedicated workspace close to a power source, this won’t be a problem. Find more great products like this by checking out our guide to the best reciprocating saws. It’s never easy making our selection, and when looking for the best glue guns, it was a little harder than expect. Luckily, to ensure we only select the best and brightest products for you, we’ve put together 2 pieces of criteria to separate the good from the great. Reviews - We didn’t get the chance to try these glue guns out ourselves, so instead we relied on the wonders of online product reviews to get an idea of how good these products are. Written by those who have used glue guns all their lives, or at least since they could hold one and pull the trigger, these are people who know their stuff. They gave a superb insight into what makes a glue gun effective, but more importantly, they helped us understand how safe they were (or were not), how fast they heated, how easy they were to load and reload, and whether the glue stream was smooth. Price - While glue guns are not the most expensive item you’ll ever buy, keeping the price in mind when making our selection was an important thing to consider. Often, price indicates quality, and when working with hot glue (or anything hot, really) quality is paramount. That being said, the heavy vetting we did of the products through thorough research (plus reading reviews) helped us ensure that they were reliable, regardless of the price. We searched for a range of prices that were affordable for all applications. Whether you need a glue gun for professional demands or one to keep at home for easy fixes and repairs, we’ve got something to suit your budget. While it may seem like an easy choice by now to pick the best glue gun for you, we’d advise you to hold off making your order final. First, check out these 8 key features to look for to ensure you select the right option for you for all your craft, repair, or design needs. Temperature - High temperature glue is often preferred, but it is not always ideal, especially if working with kids. Low temperature set quicker and there is less risk of burns or accidents. If you need different temperatures, you can find a glue gun with a variable temperature for better versatility. Make sure you buy the right glue sticks for the glue gun temperature range. Stand - A stand isn’t essential but if you want to protect your counters from hot glue damage, they are useful. Some stands work better than others, though, and if it’s too ineffective, you may end up just laying it on its size, which is fine, as long as it doesn’t leak. 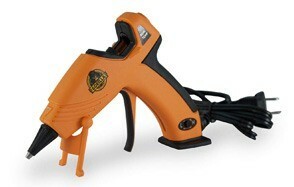 Cord - Corded glue guns provide consistent power throughout your session and are often more powerful. If you need to use your gun for long periods, a corded option is a good idea. Cordless - Cordless guns offer better mobility and don’t restrict you to one area. However, the battery will run down, and if you don’t have a replacement battery on hand, you won’t be able to complete your work until you do. Feed - The feed is where you insert glue gun sticks. Different models offer different sizes, so keep this in mind when searching for your glue stick. If your feed is too large or too small for the glue sticks, it won’t work properly. Size - The size may affect how easy or comfortable it is to hold and the glue stick capacity. Larger guns are better for bigger projects, but small ones are easy to store and reduce fatigue when working. 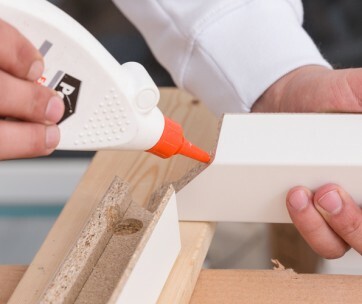 Power - High power glue guns can work for longer and stream the glue out for longer. These are ideal for professionals, but are not as needed with casual hobbyist crafts. 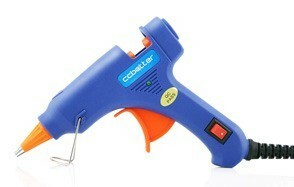 Q: Can I use low temp glue sticks in a high temp glue gun? A: No. There is a reason these types of glue sticks are separated. A low temp glue gun should only be loaded with low temp sticks, much like a high temp glue gun should only have high temp sticks. This is to ensure safety and prevent potential damage to whatever you’re working on. Low melt glue guns are safer to use and pose less of a risk from burns while also working better with heat-sensitive materials. It also dries quicker than its much hotter counterpart. Hot glue is preferred for heavy duty projects, but brings the risk of burning. However, if you have a glue gun with variable temperature, you can invest in all-temperature glue sticks to ensure you don’t cause unnecessary damage to the parts or your material. Q: What materials can you use a hot glue gun on? A: With few things more reliable and simple to use than a hot glue gun, you can use one on most materials. For glue gun crafts, you can use it with wood and fabric, and for DIY repair jobs around the house, they are suitable for use on plastic. Really, there are no limits to what you can use with a glue gun. Along with repairs, you can use them to protect rubber ducks from carrying diseases such as E.coli if not properly drained by plugging the hole in the base, and also to stop your kids from slipping all over your new waxed floors by adding treads to the bottom of their socks. They work fine on vases, regardless of what crockery the vase is constructed with, and you can also use them to close boxes ready for shipping.